Earlier this week EPA Administrator Scott Pruitt issued a directive that prohibits scientists from serving on the EPA’s independent scientific advisory committees if they are currently a principal investigator or co-investigator on a research project that receives grant funding from the agency, or “if they are otherwise in a position to reap substantial direct benefit from an EPA grant.” Pruitt justified this unprecedented ruling on the eligibility of certain members of the public to serve on federal advisory committees by titling his directive “Strengthening and Improving Membership on EPA Federal Advisory Committees” and stating that committee members “shall be independent from the agency.” The problem, here, is that Pruitt’s policy runs counter to existing conflict-of-interests law, and is on its face arbitrary and capricious, in violation of the Administrative Procedures Act. A direct and predictable effect is one that has “a close causal link” between the decision made and a financial effect, and where there is a “real, as opposed to a speculative possibility that the matter will affect the financial interest.” (5 CFR 2635.402(b)(1).) Importantly, “a particular matter that has an effect on a financial interest only as a consequence of its effects on the general economy does not have a direct effect within the meaning” of the regulation. Here, rulemakings establishing toxicological or environmental standards – the sorts of things on which EPA’s scientific advisory committees give non-binding advice – might qualify as particular matters, in some circumstances, to the extent that they regulate a discrete industry. Similarly, a standard coming out of EPA might have a direct and predictable effect on regulated entities, and those that own stock in or are employed by them. They don’t have a “close causal” link to scientists working in universities or in independent centers. And a scientist may be said to have a “financial interest” in a particular standard to the extent that they are employed by someone subject to it. But it is an untenable stretch of logic to say that a scientist who receives grants from EPA to study air pollution has a financial interest in any individual air pollution standard. However, let’s just say that, for instance, an epidemiologist on a 5-year grant from EPA to study the effects of particulate matter on children’s health – from which their university takes 50%; 30% goes to fund their team of researchers, their lab, operations costs, and so on; and 20% goes to fund some percentage of their salary – does somehow qualify as having a “financial interest” in the “particular matter” of air pollution. 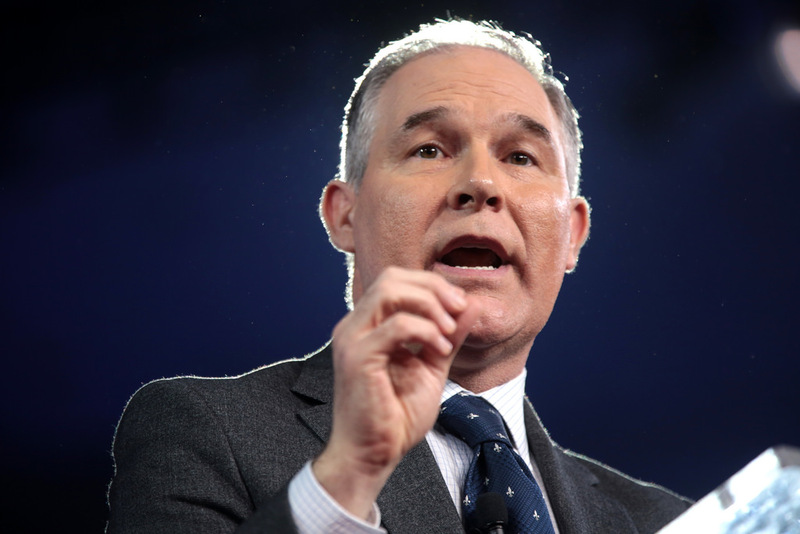 Pruitt’s directive still fails, for at least two reasons. First, a scientist serving on an advisory committee can only be prohibited from holding or acquiring such a “financial interest” if the interest would “cause a reasonable person to question the impartiality and objectivity with which agency programs are administered,” or else by an individual determination that the financial interest creates a “substantial conflict.” (See 5 CFR 2635.403.) Here, there is no way a reasonable person would question the impartiality and objectivity of EPA’s programs based on EPA-funded scientists participating in advisory committees which make nonbinding recommendations to the agency. Indeed, the whole point of the committees is to enhance the impartiality and objectivity of the programs by including just these kinds of scientists in the process. What’s more, there has apparently been a collective determination, under the guise of Pruitt’s directive, that advisory committee members holding grants from the agency have a “substantial conflict,” but there has been no process, no notice given or comment taken, no hearing held, no record compiled, no reasoned explanation. Second, these scientists would qualify in almost every instance for an exemption articulated for exactly this situation – that is, an exemption for employment interests of special Government employees serving on advisory committees. (See 5 2640.203(g).) Under this provision of OGE’s regulations, a scientist “serving on an advisory committee…may participate in any particular matter of general applicability where the disqualifying financial interest arises from his non-Federal employment or non-Federal prospective employment, provided that the matter will not have a special or distinct effect on the employee or employer other than as part of a class.” That is precisely the situation here. The people Pruitt is trying to exclude from serving on committees advising on environmental standards are specifically exempt from the purported conflicts of interests Pruitt has implicitly invoked. Setting aside the ways in which Pruitt has run afoul of federal conflict of interest laws, the directive is subject to challenge directly, under the Administrative Procedures Act. Standing on its own, the directive is a policy that is subject to arbitrary and capricious review. Given the inherent contradiction in excluding scientists who receive EPA funding but including scientists who receive funding from companies subject to EPA regulations, the rule is on its face both arbitrary and capricious. The total reversal of longstanding policy on criteria for membership in scientific advisory committees at EPA, the new policy’s inconsistency with similar criteria used by other agencies that rely on science to formulate standards and policies, and the lack of any coherent explanation will all also weigh against the directive in a court of law. If the directive is understood as an interpretive rule, for instance one interpreting the federal conflicts of interest law for EPA’s purposes, it will be analyzed under the Skidmore doctrine, which gives deference to agency interpretations to the extent the agency’s rationale is persuasive. This is not a high level of deference, and, to put it simply, Pruitt’s rationale is not persuasive. Before any scientists volunteer to step down, and before any withhold their applications, Pruitt’s policy should be subject to judicial review, and EPA forced to defend its indefensible position in court. Why should the American public be at all surprised by the appalling actions by the head of EPA. any other Trump cabinet appointees, or Trump himself, for that matter. After all, it was the electorate that put Trump and the Republicans in office to do the damage to our society and health and safety laws they have enthusiastically embarked upon. And until the American voter turns his and her back decisively on Trump and the Republicans, neither law nor common sense will likely prevail. The wholesale damage now being done to American society will take decades to reverse, if ever.